A poignant photograph taken a few weeks before the First World War began is a vivid reminder of the price made by former boys of Oakham School. The photograph shows the First Eleven cricket team taken in the summer of 1914. It had not been an outstanding season in any way. 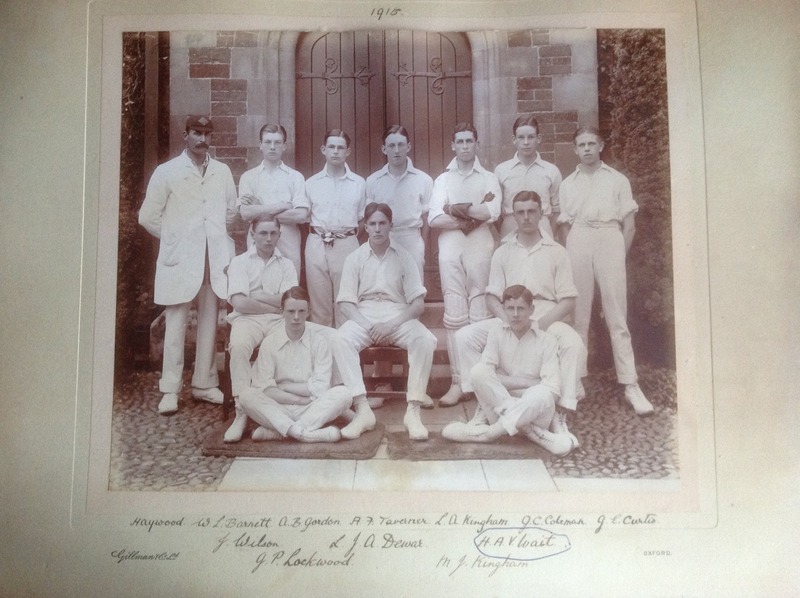 The team had played nine matches, won two, lost five and drawn two. The boys’ faces are serious, the photograph carefully posed. Underneath are the boys’ names and it is here a shocking statistic emerges. By the end of the war, five of these boys would be dead. The boys would all have been members of Oakham School’s Officer Training Corps. Public schools’ OTCs would provide many of the young officers needed by Kitchener’s new armies. These would be the men leading platoons and companies over the top in the great offensives of the war, at the Somme, Paschendaele and Arras. 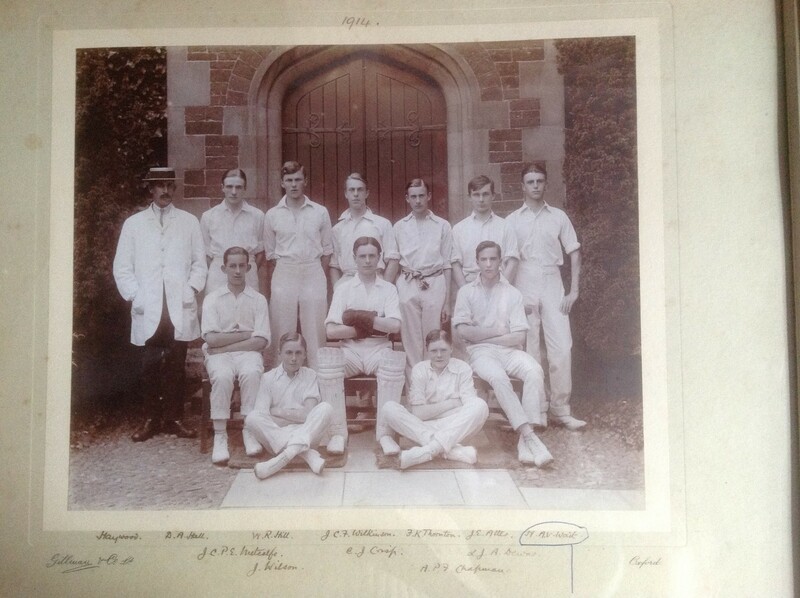 This is what happened to them: Back row, John Haycock, the School’s cricket professional, who returned to his post after war service; Douglas Hall, Captain in the Yorks and Lancs Regiment, killed at Arras aged 22; William Hill, Lieutenant in the Durham Light Infantry, died as a prisoner of war aged 22; John Wilkinson, Lieutenant in the London Regiment and Royal Flying Corps, won the MC and served in the Second World War; Francis Thornton, no details known; James Atter, Private in the Leicestershire Regiment, killed near Arras, aged 19; Herbert Wait, Lieutenant in the Royal Berkshire Regiment, killed at Paschendaele aged 19; Sitting, John Metcalfe, Captain in the Lancashire Fusiliers, won the MC and served in the Second World War; Eric Crisp, Captain in the Royal Navy Air Service and died in 1980; Lancelot (Jack) Dewar, Sub-Lieutenant in the Royal Marines Light Infantry, killed at the Somme aged 20; Front, John Wilson, Captain in the KGO Light Cavalry, Indian Army, also served in the Second World War; Arthur Chapman was only 13 in 1914 and did not serve in the war but went on to captain Kent and England, helping to win the Ashes in 1926. Arthur Taverner, Second Lieutenant in the King’s Own Shropshire Light Infantry and killed on the Somme aged 19; Jack Dewar is now the Captain, and Herbert Wait is sitting down at the front on the right. This team did slightly better than their 1914 colleagues, playing nine matches, winning four and losing five.